With fluid lines, an aggressive grille and athletic shoulders, the Renault KADJAR is boldness incarnate. Inspired, solid and sporty, it's by your side in whatever you do and is ready to venture into new horizons at the drop of a hat. ​Be adventurous every day and set out to discover the city in a new light. 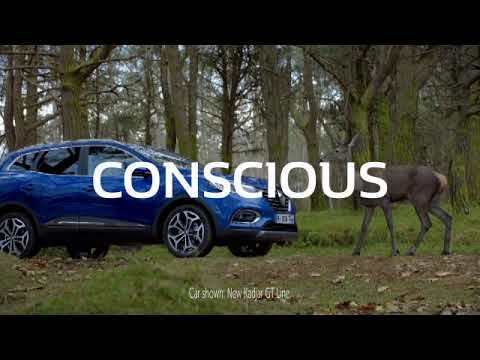 With its Stop & Start and regenerative braking system, the KADJAR is a top performer in consumption and CO2 emissions (99g of CO2/km*), making it an eco leader. Personal Contract Purchase (PCP) offer for Retail customers only. Not for Business Users. Representative 4.9% APR available on All-New Kadjar Dynamique Nav 1.3 TCe, when registered and proposed for finance through RCI Financial Services Limited in conjunction with Renault UK, P.O. Box 495, Watford, WD17 1FJ. As the credit broker we may receive commission from the lender for referring you. This promotion cannot be used together with other manufacturers promotions and is subject to availability. Prices shown are for new vehicles registered and delivered while stocks last. All details are correct at time of publication and are subject to change without notice. Offer may be varied, withdrawn or extended at any time.